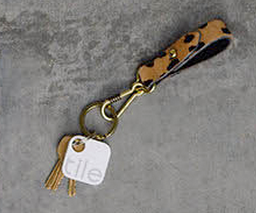 New tech toy TILE has been making a lot of noise the week in advance of the product release on the 8th – potentially the perfect gift for anyone on your list who frequently looses their keys or the tv remote. Attach a Tile (1.4 inch white, water-resistant square) to an item and download the app (available for Apple iOS devices with Bluetooth and coming soon for Android) to set up tracking. Using Bluetooth, the app records the last place your Tile was located. When you begin tracking a lost item the app’s tracking circles let you know your progress-a little like “you’re getting warmer.” The Tile also plays chimes until it is located. You can name and track up to eight items and a Tile costs $15-$25 each depending upon quantity ordered. The team behind this Silicon Valley startup envisions a community of Tilers, using their app for good. If you pass by a lost item that has been Tiled, a location update will automatically be sent to the owner who is searching for that lost item. This concept of the “world’s largest lost and found” will only be as effective as the number of Tile users. Here’s a snappy video that’s way more fun than our description and a Pinterest page dedicated to the Top 50 Things to Tile. A little inside scoop from our guy in the know: stick to non-mobile items. The search range is 100 feet-so skip the pets and small children for now. Another challenge: Tile only works with Bluetooth, which with constant use drains the battery. Other early adopters who helped crowdfund Tile tend to agree: the time saved finding things lost in the house is worth it-giving favorable reviews across the board. Having weighed the cons against the fun of Tiling things-we’ve got our pre-order in and await the real deal next week. Will you give Tile a try?